We decided that today we’d try walking up to Skandashram barefoot. That’s the traditional way to ascend to this holy spot, and many (even most) people do it that way. Alan had walked up barefoot many times in the 1970s, but on this visit, we’ve been wearing sandals or shoes everywhere except in the ashram or in temples. So this was going to be an interesting experiment. There are two main caves on Annamalai (or Arunachala) where Ramana lived during the years after he left the precincts of Annamalaiyar temple. He lived in Virupaksha cave, located just below Skandashram, for the longest period, about 17 years (1899 to 1916). Then, as his mother and others joined him, attracted by the power of his meditation and wisdom, Ramana and the small group around him moved up the hill to a cave where there was a good water supply. As T.M.P. Mahadevan notes in his book, The Sage of Arunachala, the move to the larger cave (and the creation of Skandashram) was really the beginning of a Ramana ashram. The small group of devotees around Ramana lived on food offered by visitors and others devoted to Ramana. As the group grew, the need to cook regularly for devotees and visitors drove the need for more water and more space for a kitchen. 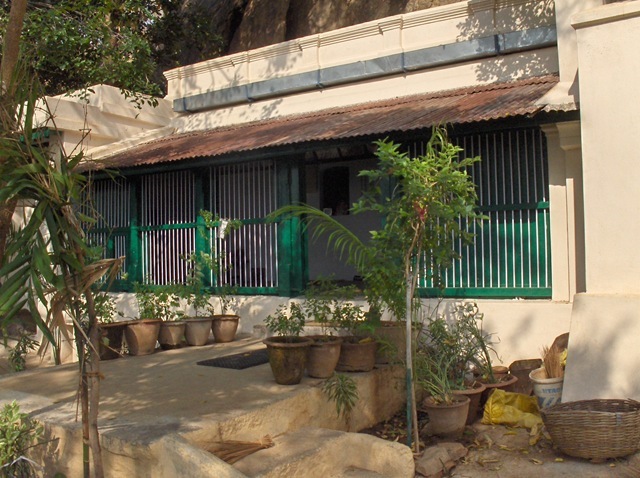 The devotees built a small building around the Skandashram cave, with a separate room for Ramana’s mother, to accommodate these human needs (and also, by the way, to share food with the animals who were also companions to Ramana and the early ashramites). You can read more about the history of Ramana’s living places and the formation of the ashram on the ashram website, and especially on this page. Walking up the hill to Skandashram (and then down a short stretch to Virupaksha cave) is one of the holy activities that ashram visitors engage in. It’s a short walk of just 1.4 kilometers, or eight-tenths of a mile, but it’s quite steep in places. The path is laid closely with stones, and the route has been carefully reforested (along with the rest of the mountain) for the past several decades. So what used to be a hot, unshaded walk up a rather bare mountain is now a lushly forested walk, filled with birdsong, butterflies flittering past, and plenty of other interesting insect life. Dogs trot up and down, monkeys appear regularly, and various people also plant themselves along the way. There’s a one-armed man who regularly sweeps the path, then asks for alms; others who simply ask for alms; an older lady who sells bananas and water; a man near the top who sells lime soda (lime juice mixed with soda water and your choice of salt, sugar or both); and several stone carvers selling beautiful little statues and pendants. The one-armed man who sweeps the path. He is there every day. During our walks up to Skandashram, I haven’t taken any photos of the actual ashram building itself, so I’ve included at the top of this post a photo from Living in the Embrace of Arunachala, a lovely blog by Richard Clarke. You might want to read his post on walking to Skandashram, which includes photos he took every step of the way. It’s interesting to note that photos of this walk, which took place nine years ago, show much less dense growth than we experience now. It’s amazing how well the plants have grown, even though Tamil Nadu has experienced some drought during these years. This year, however, the drought broke with a vengeance, filling all the tanks and reservoirs in Tiruvannamalai and its environs (and there’s flooding in other regions of South India). Below you can see full irrigation lakes in this view of the Annamalaiyar temple and surrounding town. This shot was taken from a wide rock you reach just before you get to Skandashram. Everyone stops there, including the monkeys. We started early, about 7:30 AM, following our usual hour of meditation in the old hall at the ashram, followed by a quick breakfast. Normally the walk up takes us about 45 minutes. It’s steep, and we enjoy stopping to look at all the views. Today, it took an hour. I noticed a few things immediately. First, we didn’t talk, because we were both concentrating on stepping from stone to stone to avoid the more painful grit between the stones. And we each began to set our own individual pace, more so than when our feet are shod. The not-talking let me hear many things. I always enjoy the layered sounds of birds, insects and wind, but this morning was quite different. I realized that my sandals, lightweight as they are, add a layer of sound. The sandals make quite a lot of sound, actually – the brushing of grit across stone, and now and then the soft thunk of a sandal sole on stone. Today my feet, stepping carefully from stone to stone, made no sound at all. The silence of my feet seemed miraculous in itself, and all the other sounds seemed to expand, layer by layer, until I was immersed in an ever-changing sea of sound. The other change was in the rhythm of my walk. I tend to vary my pace a lot, going slowly downhill, medium on the flat and then accelerating on the uphill, leaning forward into the incline. Today I took the uphill at the same pace as the flat: careful and deliberate. Step to step, stone to stone; I entered a kind of visual tunnel. And with the sea of sound surrounding me, I experienced the walk in an entirely different way. I hear many of the walkers on this path reciting mantra under their breath as they go. My new walking pace seemed to generate a mantra of its own. In a word – good. Both of us felt our feet benefited from the extra flexing and exercise that barefoot walking provided. We were fortunate (or maybe just careful) not to get stabbed by thorns or any stray bits of glass near the beginning of the path. The finer grit that is normally so bothersome was not too bad. We agreed we’ll do this again in a day or two. Good writeup of your walk and the background of the site. And thanks for the mention. My pleasure, Richard! Your website is an amazing resource. Enjoyed reading this post. It’s amazing what you see/feel/hear when you change things up, especially adding silence or stillness to the mix. You are so right, Laura! For a moment, I felt like I was there! Thanks for the story, Aliza. Alex, it is so great to hear that! It’s really important to me to share what’s around us and what we experience, so hearing you felt present in that moment is just lovely. Thank you!